I have a "new to me" nail polish brand I'd like to share with you today! LEX Cosmetics has taken a unique approach to their manufacturing process, in that they want the consumer to let them know what color they want, and then allow all of us to participate in the selection. If you visit their web site, you can submit your Color Story. The Color Stories (a color description you'd like to see available, and why you'd want to see it) are then selected to be placed on the site for everyone to vote on, so you could see your dream nail polish offered on their site. Each shade (they only have 10 available, but more are being added) retails for $10.00, and you can read the Color Story behind each shade, complete with who developed it and their picture. Another very nice aspect of LEX Cosmetics is their philosophy to give back a percentage of their profit to various organizations and non-profits that are important to you. There's a section on their site that discusses the organizations they are currently donating to, and there's a button you can select to let them know of an organization that you'd like to see as a recipient. 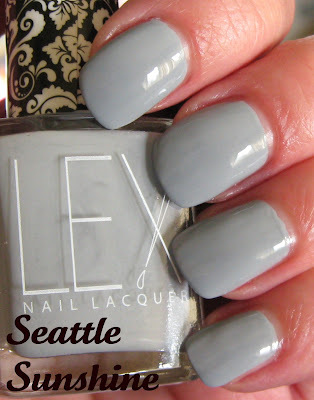 Above & Below: Seattle Sunshine is one of the shades they offer, and besides having a cute name that is very fitting with Seattle's weather, it has a formula that is top quality. I swatched this last week right after I finished swatching all 6 of Essie's Winter Collection, and it applied exactly like those. It's smooth and pigmented (I used 2 coats), and very creamy. 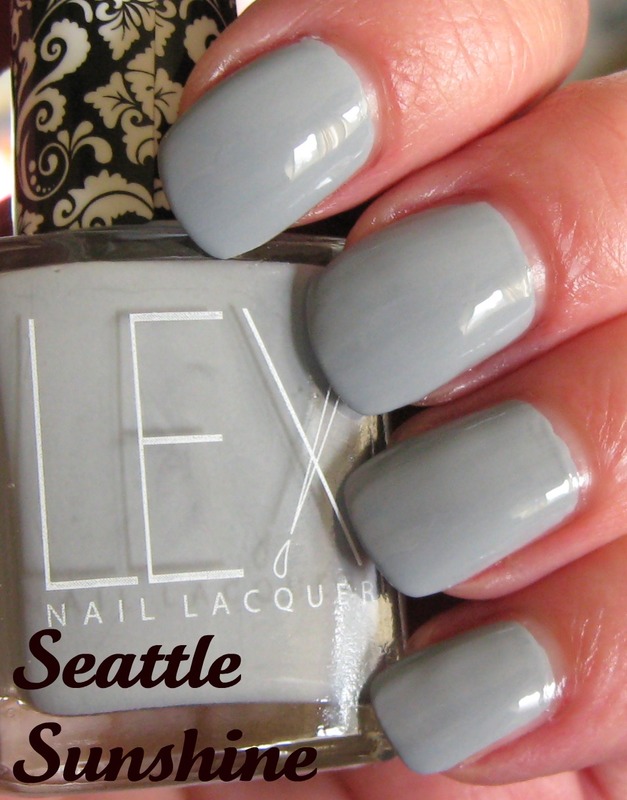 Seattle Sunshine is a pale cool grey creme. LEX Cosmetics polishes are Big 3 Free (or Bad 3 Free, as they say!) and although I don't see a weight on the bottle, they appear to be close to the standard 0.5 fl. oz. size. The cap itself is a little shorter than average, and the brush seemed well-made and applied the polish nicely. These polishes are a little pricey to me, but I think they have an excellent formula. I'm also impressed with their giving back policy and the range of organizations that are included. Their finishes are available in cremes and shimmers right now, and I'd love to see them expand on that with some glitters, holo's, and yes--duo chromes! I'll be keeping my eye on their site to see what new colors they're introducing, and who knows, maybe I'll even submit my own Color Story! The Color Stories are all fun and interesting to read, so check them out. this is such an awesome color! I gave you an Award an mentioned you on my blog. Stop by to pick it up and pass it on too! ﻿﻿1. Thank and link back to the giver of the award. 2. Sum up your blogging philosophy, motivation and experience using 5 words. I love this color! Great change! Don't forget to check out and enter my Christmas Giveaway! 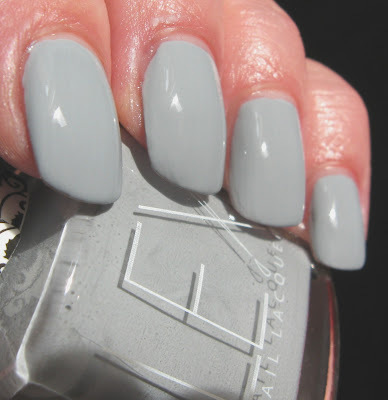 Nice grey shade. Pretty on you. I do have a few like this. Too tempting to look at another brand! my leetle nails~I probably have something similar, but I really like it too! jaljen~aww, I'm sorry! They're a fairly new company so hopefully they'll open up to International shipping in the future. Lucy~yes, not a totally unique color, but still pretty. I was really impressed with the formula and more impressed with their giving back philosophy. Angie~I like it too! Cute bottle design and good formula, agreed. feline~I thought it was a cute name--since it never really does anything but rain in Seattle, from what I understand! I just checked and Lex now ships internationally check out the website: www.lexcosmetics.com!